An unusual and hard-to-miss St. Patrick’s Day tradition in Vermont’s Chittenden County is also a fundraiser for cancer research at the University of Vermont. Ireland organizes a holiday parade of concrete mixers from her family’s concrete supplier and contracting firm, S.D. Ireland. The company’s corporate logo is a shamrock, so each St. Patrick’s Day for more than 30 years, the Ireland family has shown off its shamrocks on a fleet of mixers that tours Chittenden County. Sponsorships from area businesses are applied to the mixers’ drums, raising money for cancer research. The mixers travel around the Burlington area, honking their horns loudly, in a route that includes driving up Burlington’s Church Street Marketplace, where many families wave to the drivers. The money raised from the sponsorships—$150,000 in 2019, Ireland said—supports work being conducted at the University of Vermont’s Larner College of Medicine by Dr. David Krag and his team, who hope to untangle some of the many mysteries of cancer. “It’s absolutely solvable,” Krag said of finding much better treatments or even a cure for cancer. Dr. Krag said he and his research colleagues are now developing a possible new approach to cancer treatment, using a cocktail of nine antibodies to attack cancer cells—whereas other methods often focus on one antibody. In early tests, Krag said the lab is seeing encouraging results, finding the growth of some tumors has been dramatically stifled. The St. Patrick’s Day mixer parades, along with other donations and projects year-round, have generated nearly $5.5-million for the S.D. 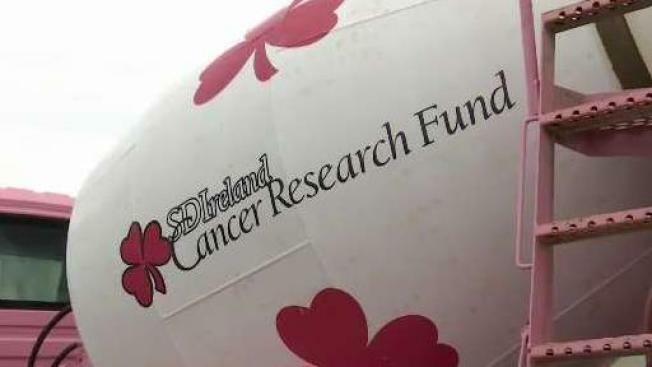 Ireland Cancer Research Fund over 20 years, Ireland said, to support the work at UVM. “It’s amazing what’s going on right here in our own backyard, which is, I think, why we have so much support from our community,” Ireland said. It’s still too soon for any human trials for Dr. Krag’s current research, but he said the lab is deeply grateful for the support from the noisy St. Patrick’s Day display of concrete mixers. “It’s a great event,” he beamed. “We’re going to keep at this,” Kim Ireland said of her fundraising efforts.